Alhaji Yakubu Gobir the Governorship aspirant under the platform of the ruling party All Progressives Congress (APC) has pledged his unalloyed loyalty and support to President Mohammad Buhari and All Progressive Party (APC). Said he still dedicated to the party and he will continue to contribute his quota to the party. Gobir who was a member of the members of ACN, that metamorphose into the APC of today, made this known yesterday during an interview session with members of his media team at his residence. 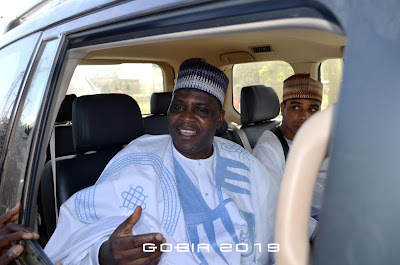 Gobir also express his dissatisfaction over the conduct of the just concluded Gubernatorial primary in the state, because of irregularities, lack of organization, and several other inefficiencies. "I want to use this opportunity to appreciate our party chieftains for the part they played before, during and after the primaries." "Also special thanks goes to all our supporters who voted massively for us during the gubernatorial primary election a cross all the 16 LGs of Kwara State." "I also want to tell all our supporters that the mandate is ours, and freedom of our dear state is not negotiable #FreeKwara will come to reality." "I am still in APC and I will continue to be in APC no matter what." "One thing I observed in this just concluded primaries is some irregularities, lack of organization, and several other inefficiencies." "#FreeKwara is a mission to end hunger and poverty in our society, create employment and providing enabling environment for business to strive."